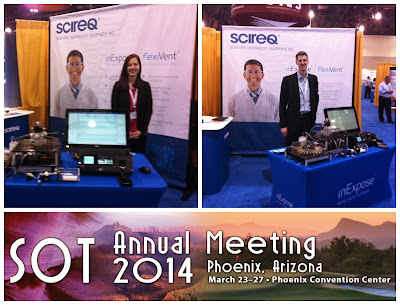 SCIREQ Inc.: Thank you for stopping by our booth at SOT 2014! Thank you for stopping by our booth at SOT 2014! We are back in the office returning from sunny Phoenix, Arizona where we had the chance to meet many researchers at the forefront of Safety Pharmacology, Toxicology, and other respiratory research fields. It was a great opportunity to see live demos of both the inExpose, our inhalation exposure system, and the flexiVent, our platform to assess respiratory mechanics. Didn't get a chance to stop by? We will be at both the Experimental Biology (April 27-29, 2014 - booth 1036) and American Thoracic Society (May 18-20, 2014 - booth 3823) conferences in San Diego. We would love to meet with you! Contact us by email at [email protected] or toll free at 1.877.572.4737. Visit us at SOT 2014 in Phoenix!